RAF Tornado jets have returned home to the UK for the last time as the aircraft prepares for retirement after almost 40 years in service. Eight Tornados stationed at RAF Akrotiri in Cyprus and used in the fight against the Islamic State group have now returned to RAF Marham. The first five jets made the five-hour return flight on Monday, and the last three flew back on Tuesday. Loved ones were on the tarmac to greet the crews as they landed in Norfolk. The Tornado, in service since 1979, and first used in combat during the first Gulf War, will leave service before the end of March. Six Typhoon jets remain in RAF Akrotiri and will take over the role of the Tornados. Asked if the departure of the Tornados will leave a gap in the air campaign against the Islamic State group, Air Vice Marshal Harvey Smyth said: "No, it won't." "We have built up our Typhoon force that it can also match that capability," he added. He said it was the right time to retire the ageing aircraft which "served the country well". Air crew of the last three Tornados to return included 27-year-old Flight Lieutenant Nathan Shawyer, who was the last ever pilot to be trained for Tornado jet operations by the RAF. He said the final flight from Cyprus to the UK was "a privilege to be part of, a fantastic sortie, an honour". Alongside him was 55-year-old Flight Lieutenant Chris Stradling who has accrued more than 6,000 hours of flying time in Tornados. 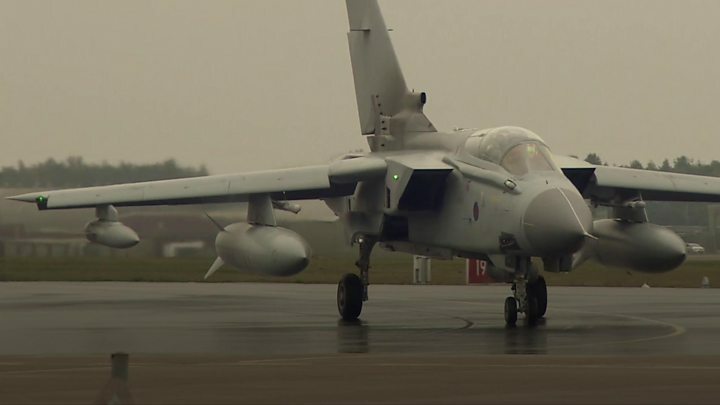 Mr Stradling, who flew his first Tornado in 1987, said it was a "real emotional day". Defence Secretary Gavin Williamson said: "After so long in service, it is only right that we now look to the future. "The combination of our state-of-the-art F-35s and the Typhoon's new weapons systems will keep us as a world leader in air combat for a generation." Video What is it like to fly the RAF Typhoon jet? Why is the UK still so reliant on the Tornado?